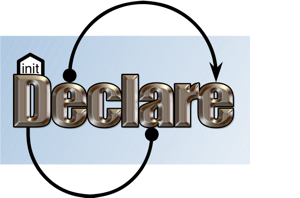 Hot on the heels of yesterday’s release of Declare 2.0.9, we have now present Declare 2.1. This version is more or less the same as the 2.0.9 release with the added ability to switch of control from within Declare and connect to the Declare Monitor for monitoring of process health. Of course, Declare 2.1 inherits these features form 2.0.9: This version is much faster, and can handle much larger models using the approach described in  and is compatible with the operational support service in ProM 6.1 described in . This version is a testing release prior to the forthcoming final 2.1 release. M. Westergaard, “Better Algorithms for Analyzing and Enacting Declarative Workflow Languages Using LTL,” in Proc. of BPM, Springer-Verlag, 2011. M. Westergaard and F. Maggi, “Modeling and Verification of a Protocol for Operational Support Using Coloured Petri Nets,” in Applications and Theory of Petri Nets, L. Kristensen and L. Petrucci, Ed., Springer Berlin / Heidelberg, 2011, vol. 6709, pp. 169-188. 1 Comment on "Declare 2.1.0 Released"